The word "croissant" has to do with the shape, so it's ironic that not all croissants are curved into crescents. Ironic, but there's a logical explanation. It involves food snobbery and hyper-regulation and is, therefore, a tale that is, like the croissant itself, classically French. I've talked before about the history of the croissant, but now I'm talking about the ingredients, because the difference in the shape is based on whether or not they are made with pure butter (straight croissant) or some sort of margarine or margarine/butter combo (curved crescent). You might already know this if, like my friend Kerry, you actually take the time to read your Starbucks pastry bag. It's annoying to read this white-on-pink, I know, so here it is, transcribed: "Our Croissant. 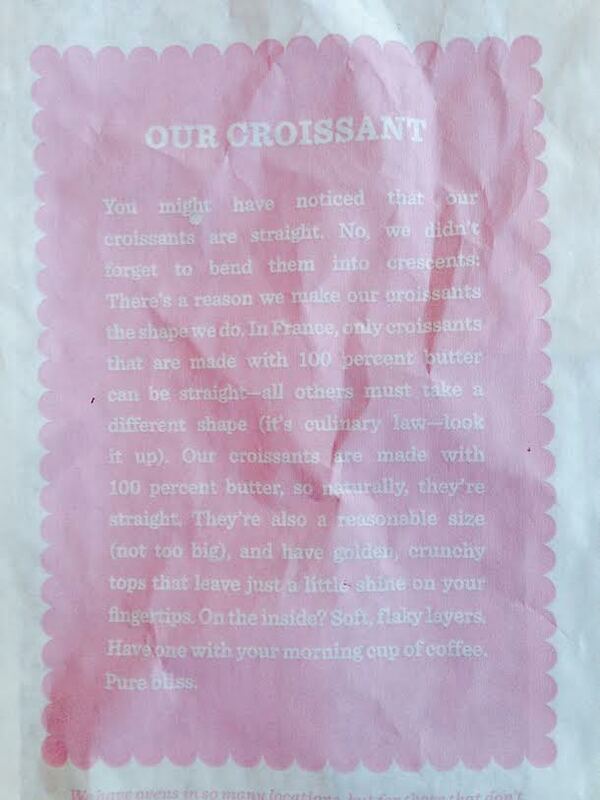 You might have noticed that our croissants are straight. No, we didn't forget to bend them into crescents: There's a reason we make our croissants the shape we do. In France, only croissants that are made with 100 percent butter can be straight -- all other must take a different shape (it's culinary law -- look it up). Our croissants are made with 100 percent butter, so naturally, they're straight. They're also a reasonable size (not too big), and have golden, crunchy tops that leave just a little shine on your fingertips. On the inside? Soft, flaky layers. Have one with your morning cup of coffee. Pure bliss." To make matters more confusing, the actual truth is that by law a straight croissant must be made with 100% butter, but a croissant made with 100% butter can be either straight or curved, at the baker's discretion. A non-pure-butter croissant may never be straight. Don't worry; even French people don't generally think about the subtleties of the shapes. In fact, not one single French friends of mine had ever heard of this distinction. But it's real, because every single French baker and bakery worker I ask immediately confirms it (especially if they're selling straight croissants and can brag about how they're made with pure butter). Generally, if a bakery sells both, the pure butter croissants are labeled "au beurre" (made with butter), and they generally cost an extra 10-20 centimes and are, therefore, very easy to identify. Those of us (French or not) who like our butter pure just pony up the extra centimes, or shop at finer bakeries, and don't worry about the shape. 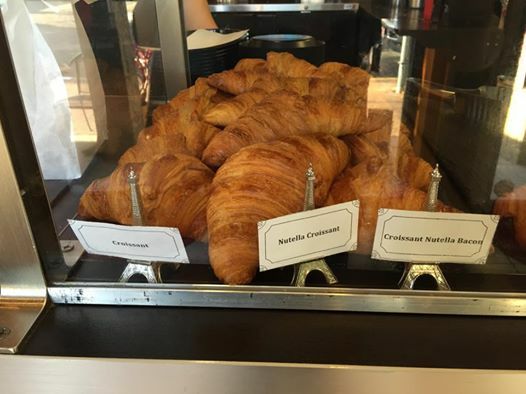 Our friend Marc, who is part-French, spotted these in an Orlando bakery and thought they were photo-worthy. Not because of their straightness mind you, which could mean anything, given that the straight croissant law probably does not apply in the US. If you start from the left, you see a croissant (normal), then a nutella croissant (interesting), and finally a "croissant nutella bacon" (disturbing). This is not the only croissant travesty: As everybody (everybody who is a croissant-loving Francophile in the Bay Area, that is) knows, Starbucks has just decided to close down the La Boulange cafés and bakeries -- a chain of French bakeries in San Francisco that they purchased just a few years ago. 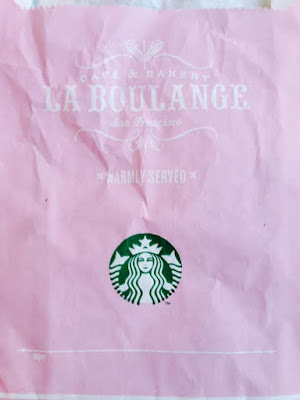 They started putting La Boulange products in Starbucks itself, but the quality was never anywhere near the real thing at the cafés. I didn't need to read it in the news, because I heard the collective groan of disappointment from here. But I am also told (though with no official confirmation yet) that the original founder/owner of La Boulange and a business partner may buy back some of the café/bakeries. So that San Franciscans can get a decent croissant. Thank God. So let's get this straight: Nobody needs both bacon and nutella simultaneously injected straight into their croissant. San Francisco needs to straighten out the La Boulange situation, before we move back. And it's always good to get your story straight, and your facts straight. It turns out, you should get your croissants straight, too. Long Blanc, down there with the least-interesting named cheeses I've encountered (Tomme Blanche being another), is a raw goats' milk cheese from the goat cheese Mecca, Deux-Sèvres in Poitou Charentes, on the Atlantic coast of France, whose name means "Long White". The irony of this cheese being named "Long White" is that it can either be long and white, or long and ash-coated black-gray. Either way, it's thick, creamy, and mild, with just enough salt and goat in there to give it some complexity. You cannot taste the difference between the two with your eyes closed, and, yes, both crusts can be eaten, mold and all. It's a lovely cheese drizzled with fruit gels or jams or honeys. This pure goat cheese Long Blanc is long and golden-white much like a butter croissant (and both benefit from a little swipe of fruit jam). Like a croissant, which can be a crescent or not a crescent, the Long Blanc can either be blanc or not blanc. Just as the straight pastry is called a crescent, the black cheese is called Long Blanc. I am French AND I knew it ! Now, does that automatically exclude me from your potential friends ?